EAST BRUNSWICK ALL GIRLS CHOIR announce national album tour! 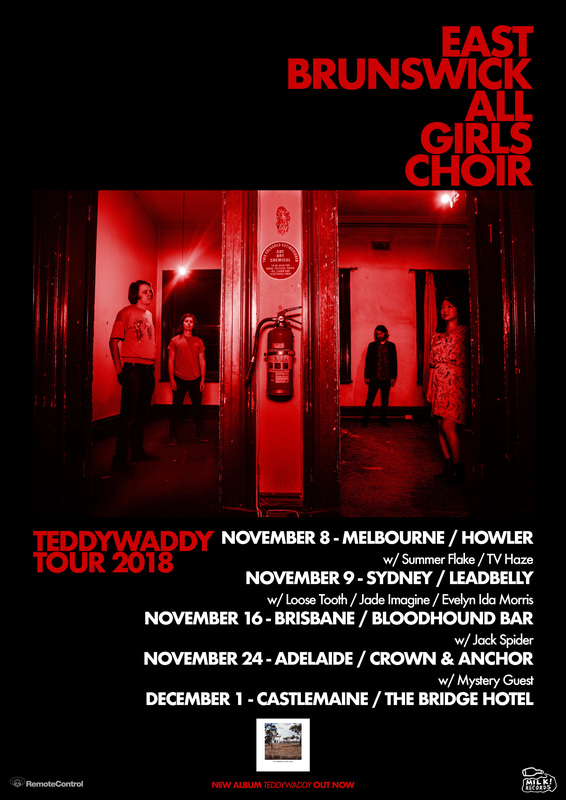 Before kicking off their Australian and New Zealand tour with Courtney Barnett this weekend, East Brunswick All Girls Choir have announced their Teddywaddy album tour this November. Catch the band perform shows in Melbourne, Sydney, Brisbane, Adelaide and Castlemaine. In addition, they will be showcasing at BIGSOUND this September. Full ticket details and links below. Following on from their 2014 Australian Music Prize-long listed Seven Drummers, Teddywaddy is the most profound and riotous statement of the band’s career, anchored at every turn by the ragged glory of Hobbs’ eruptive singing and the piercing details of his lyrics. Alongside Marcus Hobbs who pens the songs is bassist/keyboardist Rie Nakayama, drummer Jen Sholakis and guitarist Rob Wrigley. Co-produced with Anna Laverty (Courtney Barnett, The Peep Tempel), the album is etched deeply with such contrasts. For every spacious swath of majesty like ‘Rounds’ or ‘Never/Never’, there’s some punked-up exorcism like the calm-to-squall ‘Dog FM’, the nerves-fraying ‘Cicada Chirps the Chicane’ or first single ‘Essendon 1986’, an old song revisited and accelerated. East Brunswick All Girls Choir – Teddywaddy is out now via Milk! Records / Remote Control Records.